Customer photo of hand carved personalized door post installation. 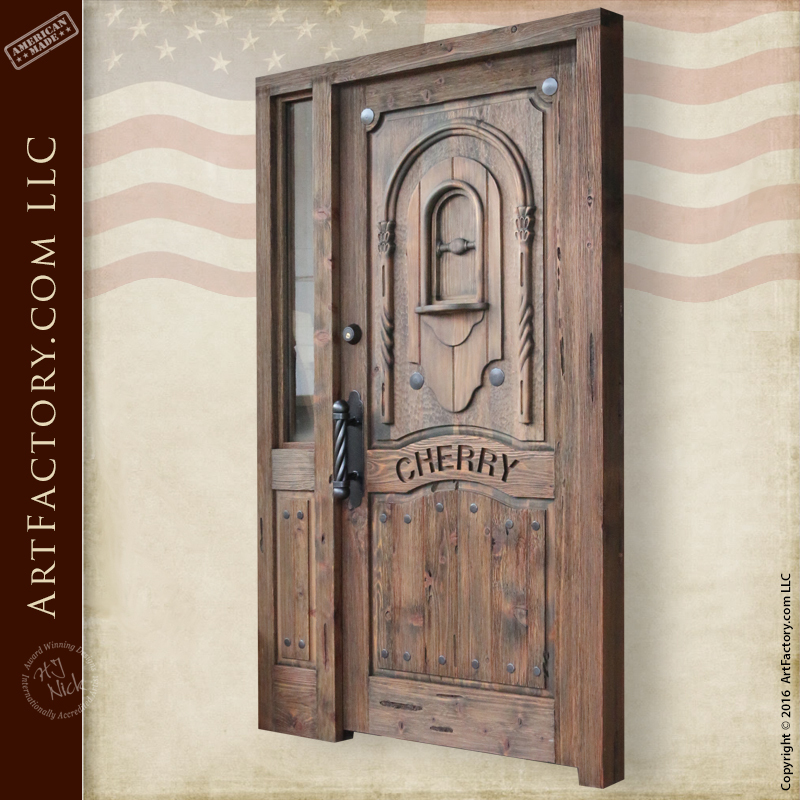 The rustic look of this door makes it the ideal entrance for your lodge or log cabin. The hand carved personalized door can be carved with anything from your last name, to your the name of your country club. This isn't just a door for cabins either. At ArtFactory.com we can build a hand carved personalized door for you in any style of your choosing. This includes modern, European, western styles and more. The fine art carving that is done by that hands of one master artist. We do not machine carve, CNC, gang carve, or use any other type of fast process. Furthermore, our doors are never mass produced. In other words, the work of one master's hands, means that you are getting an original work of art. The high relief, decorative carvings on the arch around the speakeasy portal are an example of the type of artistic detail which you will see in any product bearing the H.J. Nick signature. In addition to being built to fine art quality standards, all of our doors are hand made from all natural materials. First, each door is constructed with solid, full length American timber. 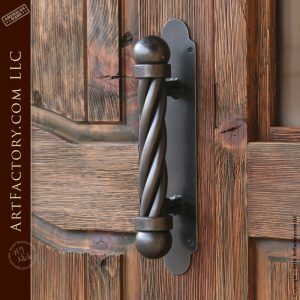 Second, all of our doors includes custom, hand forged wrought iron hardware. Not only that, but all of our hardware is also built and finished to world class fine art specifications. Finally, our sidelight window glass is thick, tempered glass that is available in hundreds of varieties of clear, decorative, etched glass, and more. Upon request, we even offer bullet resistant glass for maximum security. We add custom, hand forged wrought iron hardware on each and every door that we build. Everything down to the hinges, and heavy duty slide bolts are built with hammer and anvil, over a coal fired forge. Additionally, this door features our extremely popular ball and twist style door pull. Wrought iron clavos add to the overall rustic style of the door. Most notably, like all of our custom hardware, the hardware on our hand carved personalized door is finished with and iron oxide patina. This finish is bonded to the metal at over 1000 degrees. This means you will have a finish that lasts, and doesn't fade, chip or crack like paints and powders. The hand carved personalized door and all wood doors are custom handcrafted in the original craft and are not reproduction fast process doors. Our master-level craftsmen, wood workers, and blacksmiths use their classical training and artistry to hand build our doors using historically correct methods that have been tried and tested throughout history to last for generations. Using the correct building methods and tools is especially relevant when creating historic designs. We can recreate a design specific to each client's need for an entrance that provides both maximum security and an investment quality. Order your dream hand carved personalized door, custom designed for your residential or commercial property today. Make a proper first impression that reflects your personality and accomplishments in the same way kings, queens and other aristocracy have done for thousands of years. Call us today at 1-800-292-0008 to speak with one of our design engineers, and get started on the custom door project of your dreams. Never settle for the rest, when you can have the best, only at ArtFactory.com.